If you ask me what my favourite meat is, my answer is pork. This is kind of predictable because I’m Asian and for some reason or another all Asians like eating pork. It's like in our blood or something. Char siu is one of many famous Chinese BBQ meats that you’ll see hanging out the front of Hong Kong style BBQ restaurant windows. There is also roast duck aka siu ngaap or soy sauce chicken aka see yu gai. So why would people say that they would rather give birth to char siu and not siu ngaap or see yu gai? I asked my parents if they knew where this saying originated from and they didn’t know. I had grown up hearing this saying, I’d often hear it on Cantonese TV shows and movies in family dramas. I then asked my parents why pork and not duck or chicken. It didn’t take us long to figure out why you would want to say “giving birth to a slab of char siu would have been better” and not siu ngaap or see see yu gai because duck is slang for a male prostitute in Cantonese and chicken is what you call a female prostitute… why? I don’t know, but don’t ever say out loud you are calling chicken or duck in Cantonese, it could get awkward. This makes me think of the time when I was in Japan with my friends Karen and Crispin in 2010 and we were at an izakaya with some of Karen’s Japanese friends. We let the locals order and they asked us what we felt like eating which was met with “I’m easy, order whatever you like”. Karen’s Japanese friends asked what we meant by “I’m easy” and we explained to them that it means we will accept anything that they order. So they started repeating out loud “I’m easy” like it was some cool new English saying they had just learnt and then we realized that they should be careful with saying I’m easy because as with calling chicken or duck in Cantonese, it could get misconstrued and get awkward! 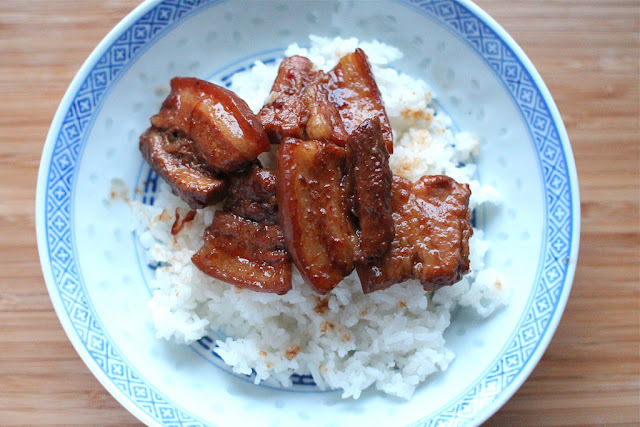 Well this isn’t char siu, I already have a recipe for char siu on my blog which happens to be my most popular blog post but this is one of my other favourite pork dishes – claypot pork belly. This is the kind of dish I love eating in winter. Pork. Fat. What else do I need to keep me warm? Heat 2-3 tablespoons of peanut oil in a wok and fry the dried red chillies until the oil is coloured red and the chillies are crispy. Then add in the ginger slices and fry together until fragrant. Add in the sliced pork belly and fry until it starts to brown. Then add in oyster sauce, dark soy sauce, light soy sauce and fry everything together so that the pork is coated with the sauce. Deglaze with Shaoxing wine and then add in the chicken stock. 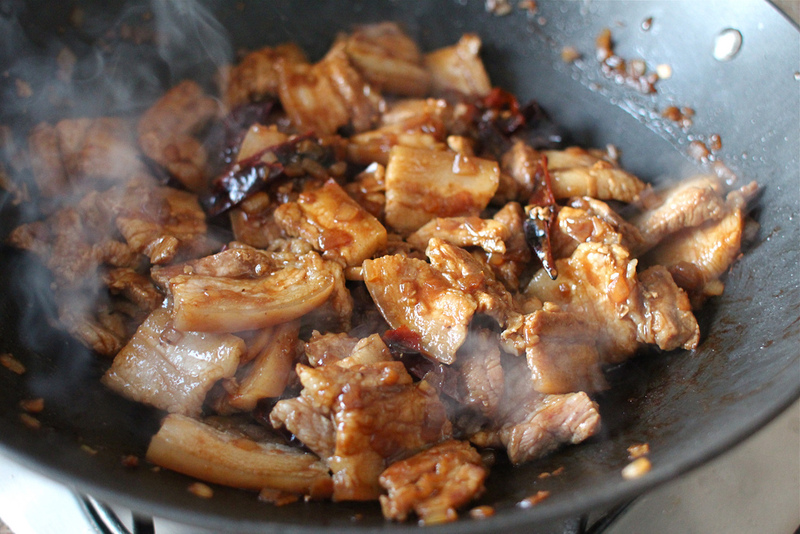 Heat up a claypot and transfer the pork from the wok to the claypot. Bring to boil, cover with lid and simmer for 1-1 ½ hours until the pork is tender and the sauce has thickened. Stir occasionally and add more water or stock if the sauce dries up. Add the spring onions, cook for a further 5 minutes and season to taste with a little salt and sugar. Add in the sesame oil last and mix together just before serving. Yum... what a great recipe! I love pork and happen to have a clay pot tucked away... am definitely going to try this. I know my Peter will love it too. Thanks so much for sharing. Yes... as a fellow Asian, I just can't give up my pork. And it seems, the fattier, the better. Haha! 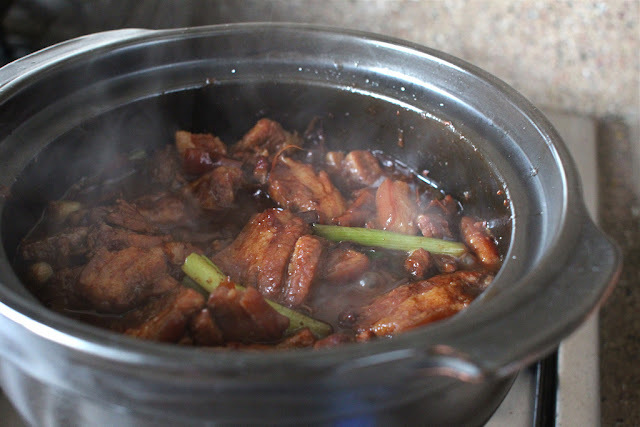 Thanks Celia for your thoughts and blog post on cooking my claypot pork belly dish for your family :) Lovely to know you enjoyed this dish and looking forward to following your blog too. Great how we can show each other new recipes. Love your dish Ai-Ling, love that Celia cooked it too and blogged it! Love your passion for PORK and I can see why. This has all kinds of YASSS written all over it!!! What a winner of a dish is this. I think I should make this soon and blog it. It won't be this pretty but I'll bet it will taste good. Thanks Maureen :) You are right, it's not a very pretty looking dish. Hard to make brown stand out but it tastes good and that's all the matters. I saw this on Celia's blog and she really enjoyed it a lot and we have similar taste so I must give this a go! Hello I am collecting together the ingredients and am going to have a go too! I have some pork in my freezer waiting for a recipe as mouthwatering as yours! many thanks Joanna - Another visitor from Celia's blog ! Making this again today! Delicious!